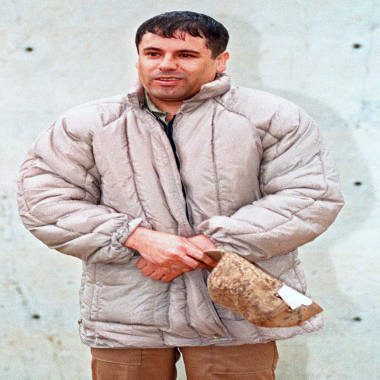 Drug lord Joaquin Guzman is seen in a June 10, 1993 file photo. Joaquin "El Chapo" Guzman is being singled out for his role as leader of the powerful Sinaloa cartel, which supplies the bulk of narcotics sold in the city, according to the Chicago Crime Commission and the U.S. Drug Enforcement Administration. "Not since the Chicago Crime Commission's first Public Enemy No. 1 has any criminal deserved this title more than Joaquin Guzman," J.R. Davis, president of 94-year-old Chicago Crime Commission, said in remarks prepared for an announcement later Thursday. It was the Chicago Crime Commission that designated Capone Public Enemy No. 1 in 1930. The non-government body that tracks city crime trends called other people public enemies, but Capone was the only one to ever be its No. 1. Unlike Capone, Guzman doesn't live in Chicago. He lives hundreds of miles away in a mountain hideaway in western Mexico. But for all the havoc he creates in the nation's third-largest city, he ought to be treated as a local Chicago crime boss, the DEA's top Chicago official, Jack Riley, told The Associated Press in a recent interview. His office is joining the Chicago Crime Commission in handing out the moniker to Guzman. "In my opinion, Guzman is the new Al Capone of Chicago," Riley says in remarks prepared for Thursday. Capone based his bootlegging and other criminal enterprises out of Chicago during Prohibition, when it was illegal to make or sell alcohol in the U.S. He eventually went to prison for income tax evasion, but he gained the most notoriety for the St. Valentine's Day Massacre 84 years ago that left seven rivals dead. Yet Riley says Guzman is more ruthless than Capone. "If I was to put those two guys in a ring, El Chapo would eat that guy (Capone) alive," Riley said while pointing to pictures of the men in his office. Sinaloa and other Mexican cartels shipping drugs to Chicago are rarely directly linked to slayings in the city, but Riley said cartel-led drug trafficking is an underlying cause of territorial battles between street gangs that are blamed for rising homicide rates. Riley described Chicago as one of Sinaloa's most important cities, not only as an end destination for drugs but as a hub to distribute drugs across the U.S.
"This is where Guzman turns his drugs into money," he said. Despite his nickname — "El Chapo" means "shorty" in Spanish — Guzman is one of the world's most dangerous and most wanted outlaws. He's also one of the richest: Forbes magazine has estimated the value of his fortune at around $1 billion. Guzman has been indicted on federal trafficking charges in Chicago and, if he is ever captured alive, U.S. officials want him extradited here to face trial. The U.S. government has offered a $5 million reward for his capture. "His time is coming," Guzman said. "I can't wait for that day."